The sign rotates off the roof. Strong neodymium magnets are often used to attach signs or light-bars to the roof of a car or truck. What magnets should be used? What magnets will be strong enough? 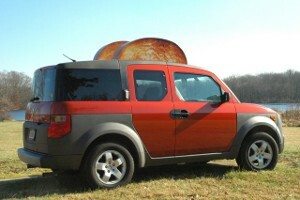 A magnetic attachment to the roof of your vehicle can be a very handy solution. It makes lights or signs easy to install and remove. It doesn’t alter the vehicle. However, it is not nearly as secure as a mechanical clamping or screw-on attachment. The dangers of having a sign, light-bar or other object detaching from the vehicle while driving are very serious. Please be mindful of these dangers. This article describes some of the ways an engineer might think about this problem, and shows some actual testing we conducted. It is not a specific recommendation for how to do this with your sign, or a recommendation of a particular magnet size as being strong enough for your application. If in doubt, don’t try this at home. If you use magnets to hold something to the roof of our vehicle, it could pose a very real danger if it comes loose. If it flies back into the windshield of the car behind you, serious damage or injury could occur. Please take these warnings very seriously. Consider an appropriate factor of safety, over-specifying the strength in your application. The goal for all of these projects is the same: Choose magnets that are strong enough to hold the sign securely in place during all expected driving conditions. For the example considered here, we constructed a forward facing sign made of wood, sized 2 feet wide by 1 foot tall. Since the wind force on any sign is largely a function of the forward facing surface area, this is a fair representative sample. We examine two failure modes: Sliding and Rotating. 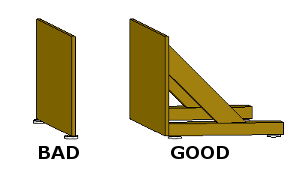 Sliding occurs when the force of the wind overcomes the friction force between the magnets and the roof. The sign slides backward along the roof the vehicle. Rotating occurs when the height of the sign gives the wind force enough leverage to “pry” the sign off the car, usually lifting the front magnets off the surface and sending the sign tumbling. Because of this rotational failure mode, multiple magnets must be used with the magnets spaced fore and aft of the load/wind direction. As shown at right, the “BAD” sign fails easily, tipped over by the wind. The “GOOD” sign fares better, since the magnets have some leverage to fight this rotating tendency. In practice, failures are often a combination of the two. As the force tries to rotate the sign, the front magnets are pulled away from the car. This tends to reduce their friction force contribution. To design a sign properly, we need some good data on how well these magnets will hold to the top of our car. Most of our magnets have listed Pull Force values, but these are tested by pulling the magnet straight away from a big, thick, unpainted steel plate. Performance on the roof of a car will be different because the surface is not thick, is painted, and isn't perfectly flat. Why are the listed pull force values listed on our product pages so much higher than what we tested on the car? There are several reasons. The thickness of the rubber cover reduces magnetic pull force by as much as 75%, since the magnet is farther away from the steel surface. Also, the thin steel surface of the roof isn’t as thick as the test plate we use for testing, so the force is further reduced. While experimenting with these measurements, we noticed a lot of variation. 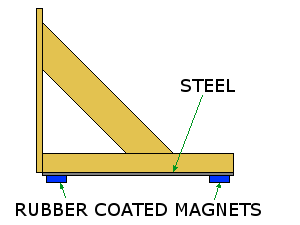 For example, if the magnet is stuck to a portion of the roof where an internal support structure lies, you can see greater forces than in an area where there isn’t a support. Warning: Math Content. You can skip this section about the theory and jump straight to our testing. This section explains how to analyze the two failure modes. It simplifies the problem by looking at them as completely separate situations, which isn’t technically correct. It also ignores a number of other important factors you should be thinking about which will be mentioned later. What is the force on the sign from the wind? Where = density of air (1.2 kg/m3), v = the airspeed (m/s), = the drag coefficient of 1.28, and A = the area of the flat plate (m2). Using these units gives the force in Newtons; multiply by 0.225 to get pounds of force. 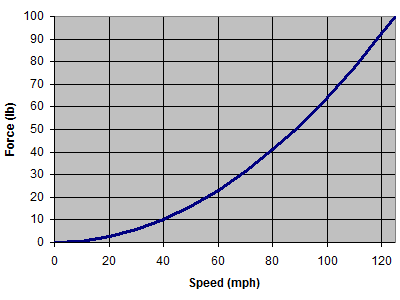 For the 2’ x 1’ sign in this example, the graph at right shows the theoretical force as a function of the wind-speed. Note that the force goes up as the square of the velocity: A sign traveling at 60mph feels 4 times the force of a sign traveling at 30 mph. That's the difference between 6 lb and 24 lb! We built a sign that uses four magnets, separated by 1 foot fore-and-aft on the vehicle. This long magnet-to-magnet distance helps resist the tendency of the sign to rotate backwards in the wind. It ignores any specification of what the expected maximum wind speed should be, including wind gusts, swirls or vortices from other vehicles, etc. We constructed a 2’ x 1’ sign out of wood. We attached four MM-A-42 magnets with MM-RC-42 covers, spaced 12” apart fore-and-aft. According to the theoretical calculations above, we might predict that this setup to fail by sliding at a wind force of 33 lb, at about 71 mph. Before driving anywhere, we can test it by measuring the push force required to move the sign on the vehicle. When we initially placed the sign on our vehicle, we measured a push force of 37 lb, a little more than predicted. After we drove around for a while, we tested the push force again and recorded 55 lb. We suspect this greater force might have been related to better friction from the rubber covers after they were warmed in the sun. Finally, the best test is to drive the vehicle at speed. The video below shows our testing up to 70 mph, with no movement of the sign. 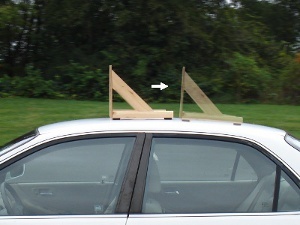 We used some blue safety ropes to secure it to a roof rack for our testing, which you'll see flapping in the breeze. 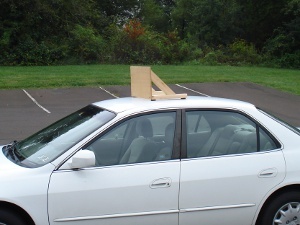 This was a simple way to make the test safer and avoid damaging our car. We also tested a few other magnets, including plastic coated magnets like our BY0X08DCSPC-BLK. While this is a great, strong, waterproof magnet, there’s less friction between the surfaces. This gave us a sliding failure, as shown in this video. The limited testing we conducted validates this way of analyzing magnetic signs. It’s a rough model, with lots of variation to be expected in the real world. We recommend using stronger magnets than the MM-A-42 magnets used in our example. The exact number and size of magnets you use depends on the size of your sign and the expected operating conditions (wind speed). We’ve heard a number success stories using MM-A-48 or MM-A-60 sized magnets. 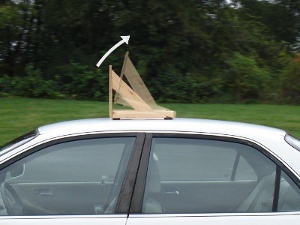 In each case, a long “fore-aft” distance between magnets was used to overcome the tendency of the sign to rotate off the vehicle. Another good solution might be our rubber coated magnets. If the bottom of your sign is made of steel, you could simply place the magnet between the steel bottom of the sign and the roof of the vehicle. Use a big factor of safety. Use magnets that are much stronger than the barest minimum necessary to hold the sign. If you were driving behind a magnetic sign in a brand new car, how secure would you want it to be? Use strategies to increase friction, such as our mounting magnets with rubber covers. Or, consider including some high-friction surface in your own design. Consider the actual speed you expect to drive with a sign. A sign for a town parade at 25 mph can successfully use much smaller magnets than one that might speed down the highway at 85 mph into a 35 mph headwind! Please be careful! Test your sign with some safety mechanism in place, like the ropes we used. Test away from traffic or other vehicles.